The theme park said the 270-acre, 50-megawatt solar facility can generate enough power to operate two of Disney World's four theme parks. ORLANDO, Fla. — This massive solar facility may not be Mickey Mouse-shaped, but Disney's new solar park is capable of powering two theme parks. 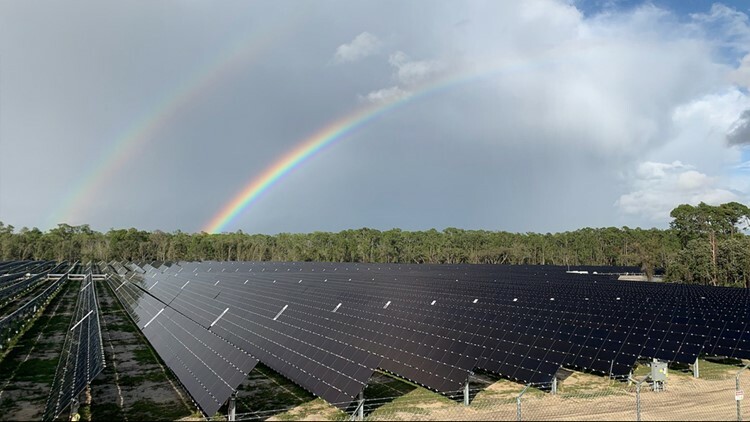 The solar facility officially went online in February and was built in collaboration with Reedy Creek Improvement District and Origis Energy USA. The 50-megawatt facility covers 270 acres and is expected to generate enough power annually to operate two of Disney World's four theme parks. The facility is comprised of more than half a million solar panels. The opening of the facility is part of The Walt Disney Company's 2020 goal of reducing greenhouse gas emissions by 50 percent compared to 2012. Back in 2016, Disney famously opened a 5-megawatt, Mickey Mouse-shaped solar facility that covered 22 acres near the theme parks.